​For me, someone who can play bassoon well is a person who, using the bassoon as their instrument for musical expression, can perform on as high an artistic level as the best performers on other instruments such as the violin, piano, voice, oboe, etc. I require my students to understand and interpret the music they are performing and to learn to express their musical thoughts and the music itself accurately and consistently through the medium of the bassoon. For this to be possible they must possess sufficient instrumental skills and control of the bassoon so that the music they conceive can be made. My approach is to work with students in such a way that every skill needed to play musically is mastered. I don't believe in technique for technique's sake. One's technique on any instrument grows and matures only if it is needed for some higher artistic purpose. All instrumental mastery stems from what is required artistically. I prefer to work with each student individually on what each one needs as a player at the time in their lives when they are studying with me. I don't attempt to do the exact same things with every student. I assess their playing often, and then take steps to help them fill in gaps in their skills and musical understanding. I use the MRSIT rubric for those assessments and for keeping track of each student's strengths and weaknesses over time. Everything that goes into performing artistically in a fashion that is engaging, inspiring, and convincing. The ability to keep steady time, subdivide, execute the rhythms in the music accurately, breathe and move one’s fingers rhythmically, and use rubato. The sound of any instrument is a combination of it’s tone and the performer's expression. To play well one must have a beautiful and functional sound. Anything and everything it takes to master all of the above including accuracy and consistency, facility, tone production, and mental skills such as subdividing and concentration. It also includes mastery in reed making. ​I take a holistic approach to my own life as a performing artist and to the lives and work of my students. In order to achieve artistry and mastery of a musical instrument one must strike a balance between mind, body, and spirit. As my students learn to play bassoon I also ask them to work towards mastery of themselves. I need them to be, and have the habits of, the sort of person who can become and be a master of the art. This includes needing them to acquire the disciplines required to do that. Maintaining physical and mental wellbeing. The ability to objectively observe one’s self and one’s work, deduce problems and the solutions to those problems. Both in their playing and in their lives. Possess a sense of seriousness of purpose and drive concerning work and career goals. This includes being able to manage their time, have planning and organizational skills, and creative and critical thinking skills. 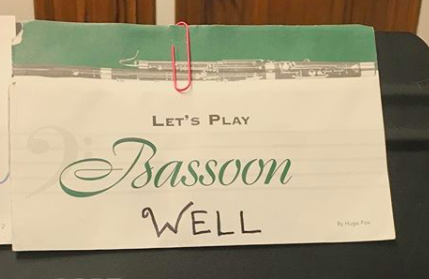 Bassoon study in my studio at Eastman includes weekly private lessons, weekly studio and excerpt classes in which students perform for the class, private and class reed making instruction, ensemble performances, concert attendance, examinations, and guest master classes.